Our Black German Shepherd Rescue, Caesar! Our Black German Shepherd Caesar! We have been wanting to get a shepherd for quite some time. Our local SPCA had a courtesy listing for Caesar who was in foster care. We were the lucky family to adopt him and he has been a wonderful pet!! He has a wonderful temperament. He's about 3 years old and does need some training. Due to his size I can't control him on a leash if he spies a squirrel or another dog. We're working with him. Be patient with him and work with him everyday and one day you will just wonder how you ever lived without him before :) I wish you nothing but the best and loads of success with him. Please keep us posted on his progress! And good luck too! 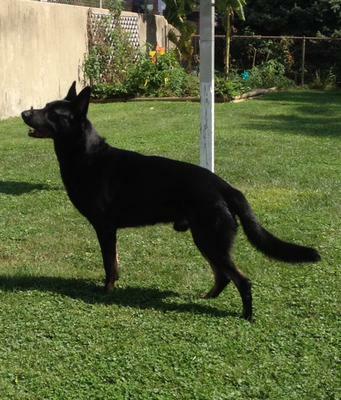 Comments for Our Black German Shepherd Rescue, Caesar! Thank you for your kind words. We adore our sweet Caesar. The vet found a very serious heart murmur which is probably why the original owner let him go. Right now we're just focusing on loving him and providing the best home. Join in and write your own page! It's easy to do. How? Simply click here to return to black GSD.